Sometimes innovation is born out of necessity. When you don’t have all the ingredients or equipment, you improvise (camping comes to mind from personal experience). I think this is how the baked eggs benny came to be at Acme Café. The Acme Café doesn’t have all the kitchen equipment one would expect for a diner. They don’t have a large griddle top or a deep fryer. When I spotted the baked eggs benny on the menu, I assumed they baked a whole egg, instead of poaching for the benny. I was very wrong. 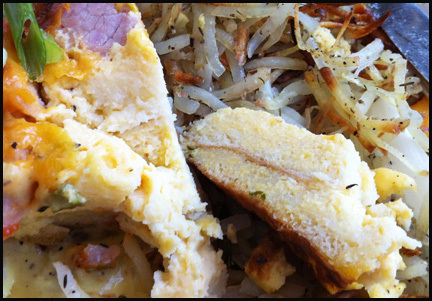 What I was served was a cross between a frittata, French toast and an eggs benny. The cook really mixed things up with this dish. The breakfast entrée was essentially a buttery egg mixture pour on top of bread and then baked. Somewhere along the cooking process, slices of country ham are placed on top as the ham was at the top but somewhat embedded into the mixture. 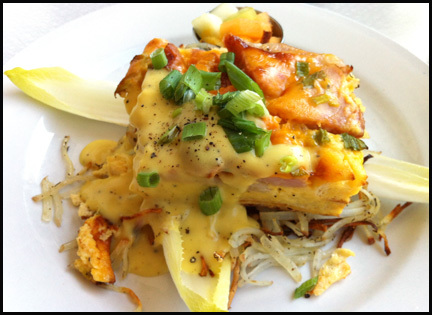 The concoction is sliced into pieces and topped with a hollandaise sauce. The meal is completed with crispy shredded potato hash (well-seasoned and had enough crispiness) and side of fruit salad. Too be honest I was perplexed by this dish as I had never had anything like it before. Part of the bread had the same texture as French toast as the bread must have soaked in some of the egg mixture during the cooking process. The frittata part of the dish was buttery, had a nice smooth & soft texture. The ham provided saltiness to the meal and the hollandaise add a touch of richness. Personally I would tweak it by adding some tartness to the dish, whether it’s increasing the lemon flavor in the hollandaise, adding a salsa verde or tomatoes (slices or red salsa on top with the ham) to the entrée. However this would be my personal preference. Overall it was a solid breakfast and its uniqueness is worth coming down to Acme Café. Other Recommendations for Acme Café: The Meat Loaf Sandwich & the Baked Good Counter. Their meatloaf sandwich comes with two 1 cm thick slices of homemade meatloaf, smothered in cooked onion, BBQ sauce, mustard, Swiss cheese and topped with arugala. All these ingredients are served in a pretzel bun. 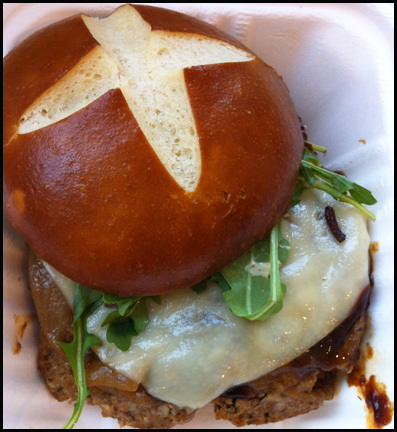 It’s hearty, savoury yet well balance with the peppery greens, and sweetness from the BBQ sauce and Swiss cheese. As a public service, don’t stare too long at Acme Café’s Baked Good counter located at the front of the restaurant. With an assortment of delicious looking cakes, pies, cookies and other baked goods, you will break down and buy something. 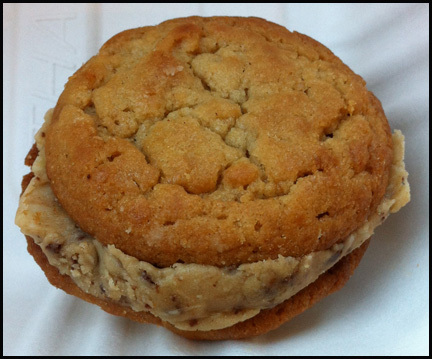 I didn’t plan to buy dessert to go with my lunch but I made the mistake of making eye contacting with baked good counter and winded up with this decadent but not too sweet peanut butter cookie sandwich.